Sisters Courtney, Norah and Raine Cassel haven't all been on speaking terms since middle sister, Raine, managed to ruin the eldest Norah's wedding several years ago. But now the youngest, Courtney is announcing her engagement and wants to unify the family for her wedding. Traveling to San Fransisco to reconnect with Raine, she realizes there are many emotions she has yet to process and isn't sure they will be a Cassel sister reunion after all. Unfortunately Names My Sisters Call Me fell short for me, unlike some of Megan Crane's previous works which I’ve enjoyed. I don’t have any sisters, only brothers and family conflict is virtually unheard of in my family, so worried it was because of this that I was unable to relate, but sadly, Kathryn felt the same way and she has a sister although also has no family drama. We’re both quite lucky in this regard, but have read many a novel in which family qualms and conflict become relatable or at the very least, enjoyable to read, but unfortunately this was not the case with this novel. I could not relate to the story line or characters, nor did I really like any of the characters other than her fiancé, and couldn’t see for the life of me why she starting questioning her relationship. The plot, although it wrapped up for me in the end and explained the main Courtney’s motivations, also fell short for me. I have really enjoyed other novels by Megan Crane but found Names My Sisters Call me a bit more difficult to love. 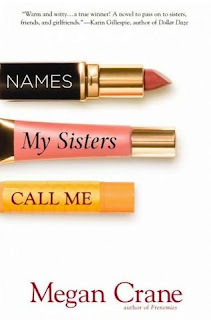 The three sisters are completely different personalities and I couldn’t really see myself as any of them which made relating impossible at first. My sister (although completely unlike me) doesn’t have the need to push my buttons at every turn which seems to be a common way for other sisters to relate! I also found the “ex” really unpleasant and so couldn’t really relate to why the protagonist was interested or even thinking of him anymore. Her fiancé was so much more interesting and I almost wish her ex had been more comparable so as to make me relate more to her dwelling on him. I soon realized that I wouldn’t be seeing my own sisterly relationship anywhere in the story and so I was able to start to appreciate each sister’s qualities and, don’t worry, there is eventually a reason for her being drawn back to her ex that becomes clear. All in all it moves quickly and with purpose which made it fun to read. I also found the protagonist and her cello ties really interesting and this was actually where I found her to be most relatable to me (even though I don’t play an instrument with skill at all!). Towards the end you do feel closer to her and for anyone who has a sister who isn’t quite like them this story will probably ring a lot of bells and make you laugh. Despite all of this though, it was definitely not my favourite read.